Did you know? The Board of Trustees is made up of student family members and community volunteers all giving a little time each month to help keep the school growing and going strong. We need your help! Any time you can give, any involvement you are able to have - and your commitment can be flexible as the Board understands how busy our families and lives are - would help keep the school we all love moving in the right direction at this crucial time of growth and building! Volunteerism is an important part of the Montessori philosophy and we need all family members - parents, guardians, grandparents - to play a part in any way they can. We also need members of the community to serve on the Board, so if you know someone in the Gettysburg area who would be willing to volunteer, please let us know. No special expertise or experience is necessary! No matter what your background, skills, or availability, there is a place for you on the Board! The Board is currently looking to fill a vacant seat and there may be several open seats for the 2019-2020 school year. Please email board@gettysburgmontessoricharter.org to find out how to become part of our amazing school's governing body! Jill and her family live in Hanover with their four children, who all attend GMCS. 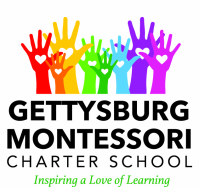 This is their fifth year as proud Gettysburg Montessori parents! Outside of her role as mom, she works part-time for a landscaping company. She has been a preschool substitute teacher for several years and will soon start as a guest teacher in the South Western School District in Hanover. In her spare time, she enjoys playing tennis, traveling and being anywhere on the water. ​Becky has resided in Gettysburg since 2005, and has 2 sons attending GMCS, Elijah and Phoenix. She is a Licensed Clinical Social Worker operating Gettysburg Counseling, LLC, an outpatient behavioral health practice located downtown, where she provides therapy to individuals, couples, and families dealing with a multitude of behavioral health, life, and relationship challenges. The Uppercue family enjoys spending their free time hiking, camping, visiting local and state parks, exploring homeopathic health practices, cooking/baking, listening to/playing music, visiting amusement parks, and traveling. Diana and her fiancé have lived in Littlestown for 17 years. They are the grandparents to a 2nd grader at GMCS and own a business in Gettysburg called History and Haunts, specializing in historical walking tours and other events that keep them busy throughout the year. Diana is happy to volunteer her time to help the Board and GMCS. In their spare time, Diana's family enjoys spending time together watching sports, baking and spending time on the battlefield. Lieucretia has an Associate of Arts degree in Graphic Design and is currently a Marketing Manager for a company in Frederick, MD. She and her family reside in Gettysburg with 2 children in the 2nd grade at GMCS and 2 toddlers at home. Lieucretia is happy to be a part of the board and be a part of the potential growth of GMCS. Rose and her family reside in Gettysburg. Her nephew who she raises attends GMCS. She is a Registered Nurse, Substitute School Nurse, and Substitute Teacher. She loves spending time with her family and is excited for the opportunity to serve on the board.